Historians and political junkies soon will have more Richard Nixon material to kick around, thanks to a UW–Madison professor emeritus who has fought for years to get the secret records of the former president made public. 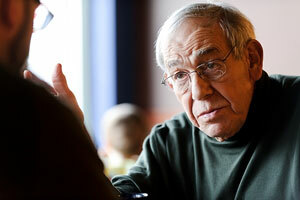 Stanley Kutler, professor emeritus of law and history at UW-Madison, is pictured during an interview at a coffee shop in Madison, Wis., on Oct. 31, 2011. Author of the 1997 book “Abuse of Power,” Kutler is an expert on former President Richard Nixon and the 1972 Watergate scandal. “This is a chance to hear Richard Nixon unplugged, if you will,” says Kutler, nationally recognized as a top expert on the Nixon administration and the Watergate era. The testimony was given in June 1975, almost a year after Nixon resigned and after he was pardoned by his successor, Gerald Ford. The grand jury was dismissed about two weeks after Nixon was interviewed by prosecutors, ultimately handing down no indictments in the wake of his testimony. News accounts at the time reported that the testimony covered the 18½-minute gap in a White House tape recording of a conversation between Nixon and his chief of staff, H.R. Haldeman; the alteration of White House tape transcripts submitted to the House Judiciary Committee during its impeachment inquiry; the extent to which the Nixon administration used the Internal Revenue Service to harass political opponents; and Howard Hughes’s payment to Nixon friend Charles Rebozo.